Phil went to Khafra Marsh in July after failing to find access to Sabkhat Al Fasl. Whilst looking around the location to try to find good access to this poorly watched wetland he located three Grey-headed Swamphens. This site is a relatively new breeding site for the species, only the second one in Saudi Arabia after Sabkhat Al Fasl, but we had seen little evidence of any birds this year so this was a welcome record showing birds are still present and hopefully still breeding. The species is increasing in numbers at its stronghold and is spreading out slowly to other areas including sightings at Khafra Marsh, Ash Shargiyah Development Company Farm and Dhahran percolation pond. 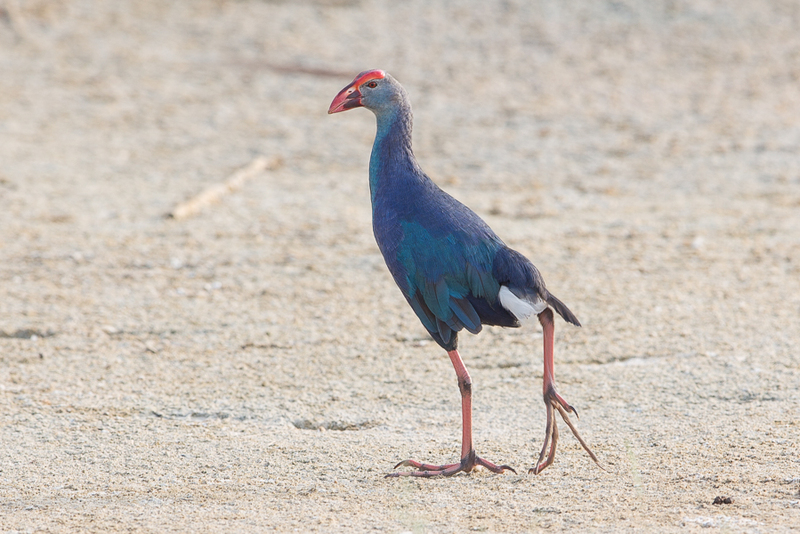 Recent DNA evidence from some feathers I sent for analysis shows these birds are Grey-headed Swamphens a recently split new species from Purple Swamphen and African Swamphen. I have recently sent some more feathers from a bird in Saudi Arabia and a bird in Kuwait for DNA analysis so hopefully we will be able to draw more conclusions from the results of these feathers.